San Francisco City Hall is considered as a fine example of classical architecture and has been designated as a national landmark. City Hall spans a two-block site of about 5.5 acres, and includes parking, sidewalks and lawn areas. The dome of the San Francisco City Hall is nearly 40 feet taller than the dome of the Capitol at nearly 306 feet. It was sheathed in gold filigree at a cost of nearly $400,000. It was designed by Arthur Brown Jr; who has to his credit other structures such as Temple Emanuel, Coit Tower and Veterans Building. 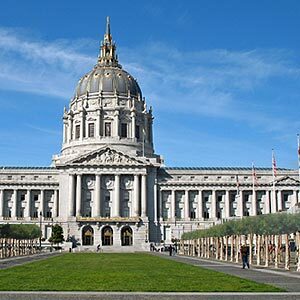 Spread over about 500 000 square feet, the San Francisco City Hall was redesigned to withstand earthquakes. Made of Raymond granite from the foothills of the Sierra, the City Hall is a contributor building to the Civic Center. The Rotunda within the City Hall of San Francisco allows viewers to take in the elegant marble staircase and forms an excellent focal point for events hosted within. The second floor balconies and fourth floor galleries can be used for VIP private dining areas and are also available for larger events. The galleries on the fourth floor of the San Francisco City Hall are used for photo shoots or receptions. The Northern Light Court is by far the most popular room within the City Hall. With nearly 7,000 square feet of space, this room is used to host weddings, dinners and events. Smaller cocktail parties or press events can be held in the South Light Court. The Civic center is a large block that encompasses many of San Francisco's largest government and cultural institutions. The main contributors are City Hall, Main Library, Opera House and Davies Symphony Hall. You can At night, the San Francisco Civic Center is a sight to behold with beautifully lit flags and fountains. Tourists can get off at Civic Center Station for BART and Muni Metro. During September to April season, the area is full of art and music lovers, wanting to catch a symphony orchestra or jazz performance or plays or readings. The Van Ness Avenue, one of the city's broadest runs straight down the Civic Center. The War Memorial Opera House, also designed by Arthur Brown Jr; is one of the finest in the world. The main library at Grove and McAllister Streets is one of the greatest public learning centers in the country and one of the most technologically advanced in the world. Spend time at the Children's discovery center and view works of art. The Bill Graham Civic Auditorium is host to prestigious concerts and public events.